Washington Street Cemetery is the third burial ground in Geneva. The earliest burial spot was on the site of Trinity Episcopal Church on South Main Street. Another early burial ground was on Pulteney Street, where the old Geneva High School once stood and the site of the new FLCC campus. 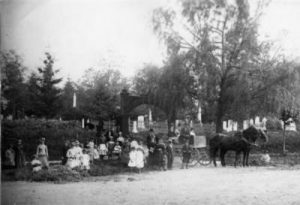 In 1832 when room in the Pulteney Street burial ground began running out, the Board of the Village Trustees purchased the land for Washington Street Cemetery. Eight years later more land was added to the Cemetery. 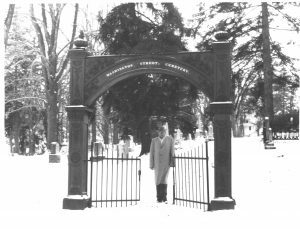 With funding from Henry Dwight, President of the National Bank of Geneva, Philotus Gaylord designed the Cemetery arch in 1844. The arch was erected at a later date. In 1984 extensive repairs were done on the Arch after it was shattered by a truck. Between 2005 and 2009, the arch was again shattered by a truck and it was not replaced. Through community support, the arch has been restored and re-installed. To celebrate the completion and re-installation of the Arch, Founders Square Neighborhood Association and the Geneva Historical Society are hosting Good Neighbor Day: Celebrating the Arch on September 17 at Washington Street Cemetery from 2:00 pm to 5:00 pm. Activities will include music, games, food, displays and various demonstrations. Good Neighbor Day is a community wide event open to the public.